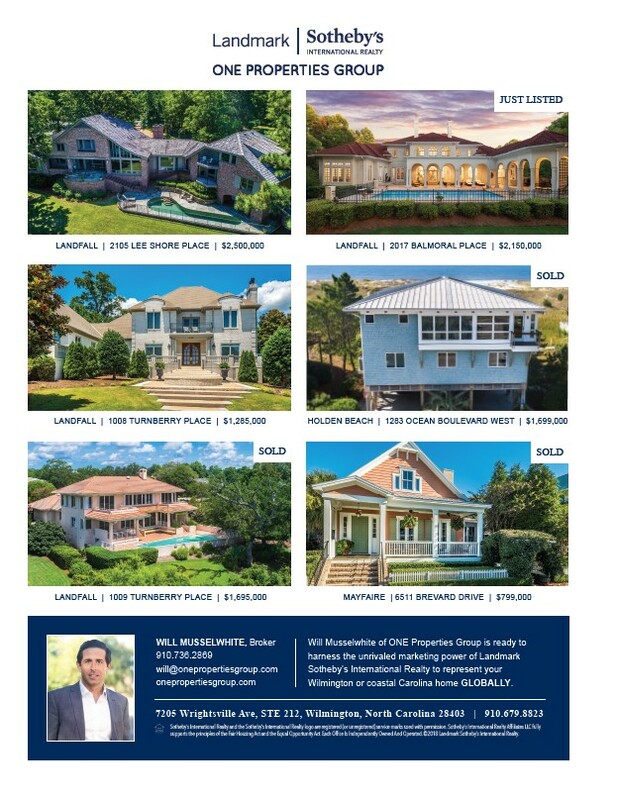 ONE PROPERTIES GROUP JUST LISTED LANDFALL | 2105 LEE SHORE PLACE | $2,500,000 LANDFALL | 2017 BALMORAL PLACE | $2,150,000 SOLD LANDFALL | 1008 TURNBERRY PLACE | $1,285,000 HOLDEN BEACH | 1283 OCEAN BOULEVARD WEST | $1,699,000 SOLD SOLD LANDFALL | 1009 TURNBERRY PLACE | $1,695,000 MAYFAIRE | 6511 BREVARD DRIVE | $799,000 WILL MUSSELWHITE, Broker 910.736.2869 will@onepropertiesgroup.com onepropertiesgroup.com Will Musselwhite of ONE Properties Group is ready to harness the unrivaled marketing power of Landmark Sotheby’s International Realty to represent your Wilmington or coastal Carolina home GLOBALLY. 7205 Wrightsville Ave, STE 212, Wilmington, North Carolina 28403 | 910.679.8823 Sotheby’s International Realty and the Sotheby’s International Realty logo are registered (or unregistered) service marks used with permission. Sotheby’s International Realty Affiliates LLC fully supports the principles of the Fair Housing Act and the Equal Opportunity Act. Each Office Is Independently Owned And Operated. ©2018 Landmark Sotheby’s International Realty.